Today I had a visit from one of the locals, I think she thought she was the queen or something, she liked to get right up and close and see what I was up to. 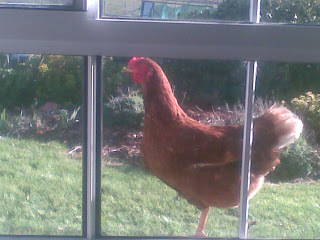 Luckily I was on my best behaviour and she soon left the window seal and got back to it. 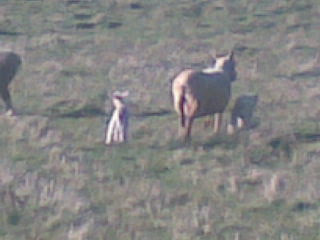 Mum and Dad have a few sheep lambing at the moment. First it was one, then the next night twins, then another one and sometime today another single, but this one didn't make it. 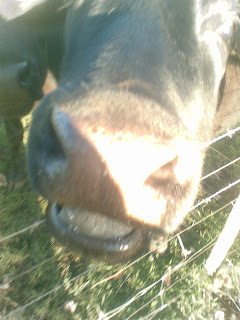 Another of the locals getting up and personal to me. Not scared this one, it wanted to lick me. 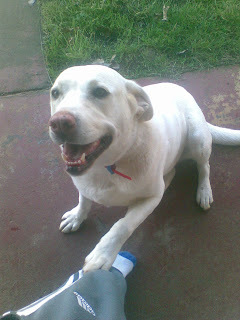 And fatso, well her real name is Tracie, I named her, she used to be my dog when she was a pup and was destroying things like the cyclone, hence the name. She became Dad's dog, when I got sick a few years back. 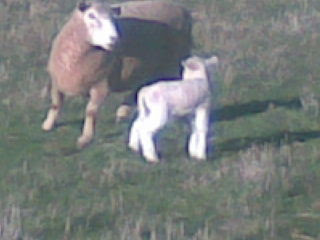 As I was walking through the paddocks to try and get the shots of the lambs( The little beggars kept running, hence the bad shots especially with my phone camera) I was thinking with spring here, how we would use to come home from church and we'd feel like mushrooms and so we'd grab a knife each and some buckets and off to the paddocks we'd go to find some. When our luck wasn't good we'd grab our knife and spin it in the air and which ever way it fell on the ground and pointed we would follow that direction. Personally I wish everything in life was that easy to follow, mightn't have worked everytime, but it was sure fun. Good to see my camera chord coming in handy Chrish!! I always think how fun it was to go mushrooming! Those were the good old days growing up on the farm. Although I hate animals, I often think it would be nice for my boys to grow up on a farm. I liked this post Chrish- cool farm animal photos! Just a collection of my happenings from time to time. A young man on the road of discovery. Who Is Visiting Right Now?